My biggest ‘fear’ with my art…. getting stuck. *insert horror face* I dont fear having a ‘block’, dont mind that at all, just the Uinverse telling me to have a break & look at things in a different way,…. but simply not changing, not evolving, ,,, doing the same thing over and over- slow death to me. 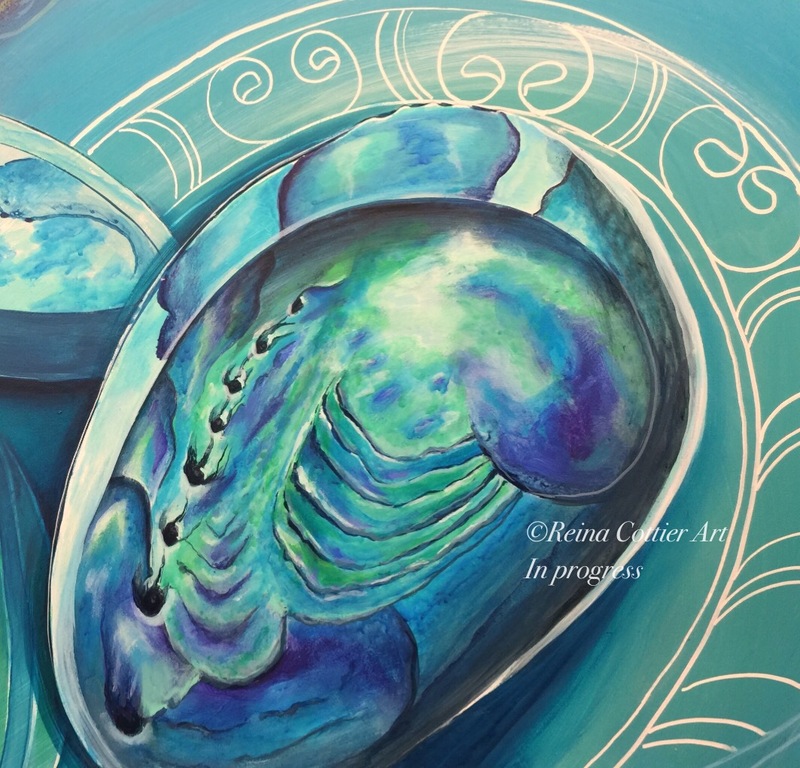 This is why you will see I have many styles, and I am always trying different things, using dfferent mediums, swinging from one thing to another, and then dipping back and forth, mixing it up. To be painting the same way & style that I was 2 years ago, 5 yrs ago, actually gives me a clenching feeling , a tightness in my belly lol! This Gemini nees constant change, and a feeling of lightness, and movement (its an AIR sign after all 🙂 !!) Dont get me wrong, I LOVE my fine detailing, native fusion of marks, symbols, patterns all flowing together as one, … my oceanic, nature, cultural, cosmic, themes,…. for me, to stretch & grow is about throwing somehting onto the canvas id never normally do /use,.. then seeing how that FEELS, good? not quite right? indifferent? I wait for the passion, the adrenalin rush, then I know Im onto something and suddenly its all going so fast I literally cant stop it. with Reina Cottier’s original designs, and uplifting words or support & guidance. Included is a leaflet with a brief explaination, extended meaning, of each card in more detail. Cards come in a grey velvet drawstring pouch. “You are about to experience the energy of my art with guiding & inspirational words. with very little alteration or editing. One shipped to NZ, one to Australia, and the last one to Usa/Canada/UK/ Europe. Price & shipping in US$ Reina Cottier Art images on 40 cards with uplifting, inspirational words. 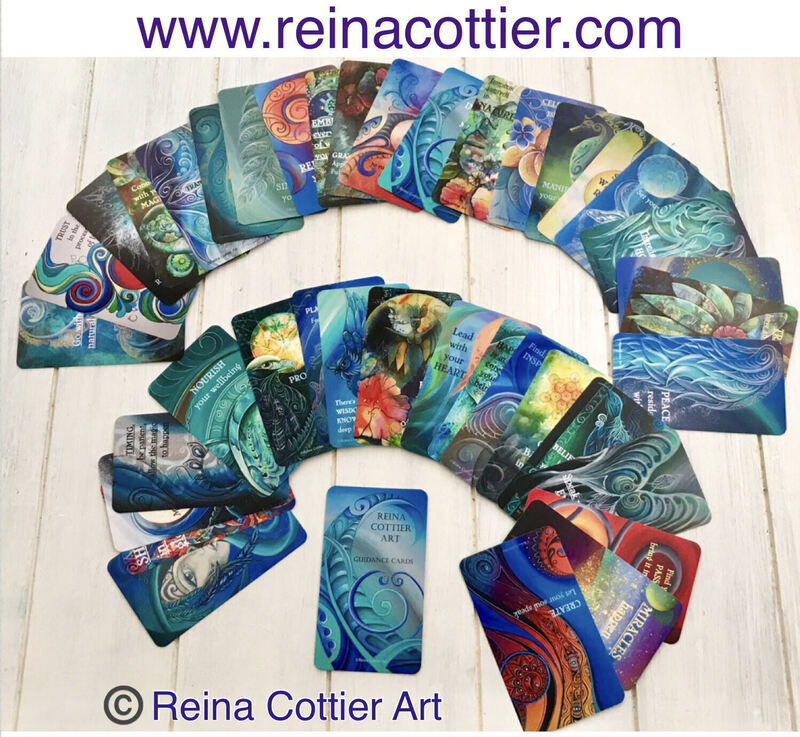 THESE CARDS AND ALL IMAGES ARE COPYRIGHT ©Reina Cottier Art 2018. ALL rights reserved.